When tragedies occur or someone is in need, what do quilters do? We sew. A couple of the Modern Quilt Guilds in and around the Boston area are sponsoring virtual sew-ins either to provide those that were directly affected by the bombings with cheerful quilts, or to send a message of hope and love to the Town of Boston. Members of other Modern Quilt Guilds around the nation are joining in the efforts by sewing either flags or quilt blocks to provide to those guilds in Boston in spreading their message. I have decided to participate in two of them – the Quilts for Boston sponsored by the Boston Modern Quilt Guild and To Boston with Love sponsored by the Vancouver Modern Quilt Guild. My first thought was I could pull together a couple of quilt blocks. Then a couple of blocks turned into 6. Then I decided I could sew a flag or two, and that has turned into 4. It’s just keeps growing. LOL. I’m not sure when I’ll stop, or if I’ll actually get anymore done before they need to be mailed to Boston; but I thought I would share with you what I had accomplished so far. I made all of these from my scrap bin, which is cool. 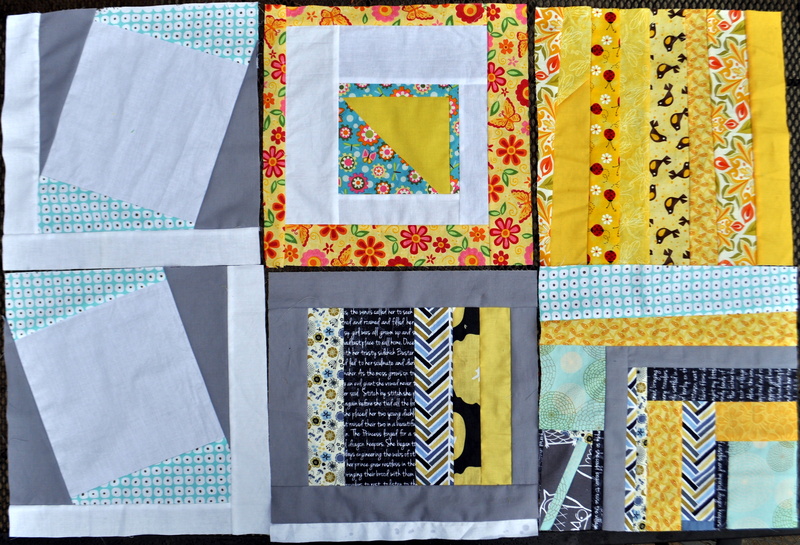 I’m always looking for ways to use up scraps and since my blocks will be combined with blocks from others around the country I saw no need to make blocks that would all match. So, it’s a great use of the scraps. Like I said, I don’t know how much more I’ll get done. I have a few other sewing projects I need to work on, the more immediate being Mother’s Day. YIKES! I’d love to hear from you if you are also sewing for these or other efforts related to the bombings in Boston. Wonder if a Texas guild is doing anything for those affected by the factory explosion these? Hmm… I think I’ll have to look that up. Signing out, with Love to Boston. This entry was posted in Quilting/Sewing and tagged bombing, Boston, buster, flag, guild, hope, love, modern, modern quilt guild, MQG, quilt, scrap, Vancouver by monkeyneedle. Bookmark the permalink.